/// Unique name of directory. 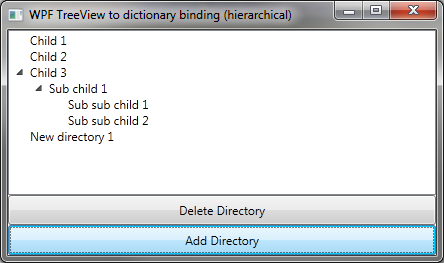 So, when a directory is removed from a physical file system, the Directories dictionary is used to perform remove the corresponding directory ViewModel by the directory name (directory name is used as an index). Have found two collection classes that solve the problem. * ObservableDictionary. The class represents keys and values as separate entities. It isn’t so convenient to bind to Key and Value property in HierarchicalDataTemplate. Furthermore, Items and Values collections properties do not implement INotifyCollectionChanged interface. * ObservableKeyedCollection. The class uses the key which is a part (!) of the values you’d like to store in the collection. The collection does not separate key and value. You need just to bind to the collection as you did it before with ObservableCollection<T> class. So, this option suits the requirements very well. The piece of code is quite self-descriptive: it creates an observable keyed collection for directories, directory name is used as a key. The collection change will be automatically reflected on the UI. P.S. After downloading please rename .doc to .zip. This entry was posted in Uncategorized and tagged data binding, dictionary, keyedcollection, mvvm, observablekeyedcollection, treeview, wpf on 2011-08-04 by Sergey Brunov. There is the following structure. Each Customer entity has it’s dictionary of Orders, each Order has it’s dictionary of Products. The sample demonstrates such a data binding. MVVM Light Toolkit is required. This entry was posted in Uncategorized and tagged data binding, dictionary, mvvm, treeview, wpf on 2011-08-02 by Sergey Brunov.